Have you ever been afraid that you’re easily manipulated–and wondered how on earth you can keep from being manipulated all (or any) of the time? I received an email recently from a young lady–a teenager–who was concerned that she was easily manipulated. She wanted to know how she can keep from being manipulated, so that any people with whom she has a toxic relationship wouldn’t be able to tear her down. Dear sister, if you’re reading this, my heart goes out to you–and THANK YOU for asking this very important question now, instead of waiting until it’s too late and someone’s manipulation gets you hurt. We all need to know how to keep from being manipulated! The thief does not come except to steal, and to kill, and to destroy. I have come that they may have life, and that they may have it more abundantly” (John 10:10). Jesus brings abundant life. However, the enemy comes to steal, kill, and destroy. None of the enemy’s dealings sound fair to me; do they to you? Indeed not. The enemy is the author of injustice. And manipulation is an unjust tactic. It’s absolutely a demonic tactic that is nothing but evil. The enemy uses manipulation to try to distract you, steal from you, and condemn you. It’s true that he often uses people to do this–but not always. Sometimes the manipulation comes straight through his demonic spirits. Always remember, however, that even if the enemy is using a person to convey his message of manipulation, the person is not your enemy. People are not your enemy. 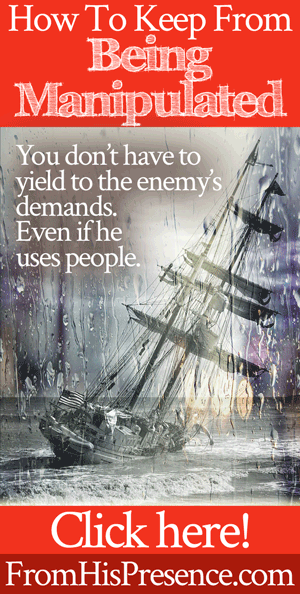 However, the enemy does sometimes use people as his vessels sometimes in order to try and manipulate you. … and I’m going to have to be really real here, in order to teach on this subject, okay? But if you’re going to be free from manipulation, we have to look at real life. One time I was helping some folks out with an extended project. The time came when I knew God was done with me in that work. All the anointing to be there left, and God told me to stop with the busy work! So I let the project leader know that I would be withdrawing, because I needed to focus on what I was called to do. And you know what? That person told me I was called to their project, not to what I knew I was called to do: the ministry of the Word. What that person said hurt. It hurt badly. It was the enemy trying to discourage me. I left the project anyway, and I’ve never looked back. My fruitfulness increased a thousandfold when I walked away from the busy work. I’m glad I left. It was the right thing to do. I’ve also had people send me emails and other messages asking me to send them money (even requests for thousands of dollars), be their social worker, solve their family problems, or solve all their emotional problems. Sometimes they even add in a personal insult or two, telling me I’m a horrible person if I won’t do X, Y, or Z that they’re asking for. These are people I don’t even know! Why don’t I do what they want? I’m not God. I can minister, and I can teach … but I can’t fix people. I can even minister healing, but you’ve got to go after God’s truth for yourself. People have to transform their lives by the renewing of their minds in the Word of God in order to have their problems solved. I’m not their source. I would be doing them a disservice to pretend that I can solve all their problems … thereby enabling them to continue looking to people other than God for help. I don’t respond to manipulation. When manipulation is involved, the request is from the enemy, not from people. The enemy is trying to get you under his thumb so he can control you, distract you, and rob you. I can still love the people who contact me like this, and I do. I can pray for them, and I do. But I’m not going to step away from what God has called me to do in order to start pretending I’m God. I’m not God. Only He is, and He does a very good job of it. This doesn’t mean I don’t help people or give to the poor. I pour out my life day in and day out to help people. And my husband and I absolutely believe in, and practice, helping the poor. But there’s a difference between that and submitting to the manipulation of the enemy. living my life the way they did. I don’t answer those accusations either. Why? Because those people don’t know me and have no right to speak into my life. Furthermore, the enemy is using those people to try and get me into people-pleasing, instead of God-pleasing. Beloved, if you want to keep from being manipulated, stop trying to make everybody happy. Stop trying to please people. You can’t please both people and God. Either you obey God, or you follow the dictates and whims of people. Personally, I stopped trying to please people a long time ago–out of sheer desperation. I was being pulled in so many directions by people that it was destroying my spiritual and emotional health. I had to give up pleasing people out of self-defense! This doesn’t mean we shouldn’t be correctable. We absolutely should be correctable. However, if God had been trying to correct me regarding any of the items above, He would have done so Himself–or He would have used a person who actually has permission/relationship to speak into my life (my husband, a pastor, mentor, trusted friend, etc). Not random people who presume to think they know anything about me or God’s will for my life. So those things above are all examples of when the enemy tries to use other people to manipulate you. The enemy also will try to manipulate you by simply sending demons to whisper in your ear. He’ll tell you’re not any good at the thing you know you’re called to do. He’ll tell you that you messed up once, and you cut off God’s blessings in your life by doing so. He’ll tell you that no one wants you. He’ll tell you that you have no hope, future, or opportunity–and never will. Anytime the enemy’s mouth is moving, he’s lying! And the same goes for his evil minions (demonic spirits), too. Related: Don’t Get Seduced by Demons! So now that we know a few examples about how manipulation happens, how can we keep from being manipulated? 3) You have to know what God’s Word says about day-to-day behavior. First, you have to know who you are. You’ll believe the insults people hurl at you. You’ll believe it when the enemy tries to tell you that you’re not talented enough, smart enough, pretty enough, popular enough, rich enough, or related to the right people. You’ll believe it when the enemy tells you there’s no hope for you. On the other hand, if you know who you are and the enemy comes against you, you can tell him to be gone in Jesus’ name. You can say, “That is not from the Lord; I do not receive it” (a favorite phrase that my pastor taught me). And when the enemy sends people to do his dirty work, telling you that you’re not _____, you can tell all those people not to poop in your Lexus. So how do you learn who you are? How do you get to that place of knowing who you are? Only one way: By hiding God’s Word in your heart. That just as Jesus is, SO ARE YOU in this world (1 John 4:17). The Bible goes on and on, listing the amazing things that you are. If you have made Jesus Christ the Boss and Lord of your life, you are beloved. You are accepted. You are forgiven. You are free. You are a new creation in Christ Jesus. You ARE. And if you know these things, you’ll be able to stand firm in them and not be manipulated when the devil tries to tell you his opinion about who you are. Secondly, you have to know what you’re called to do. Beloved, if you’re going to live a victorious life and walk in everything God has for you, you’ve got to know what you’re about. In one of my personal stories above, I would have gotten severely derailed–maybe permanently derailed–if I had listened to the person who felt I should spend my time just helping them with their project (which God had told me to leave). But if I had given in to the enemy’s lies about what I’m called to do, there’s no way I’d be where I am today. God wouldn’t be able to use me like He is now, because I’d still be using my time trying to please people instead of obeying God. Beloved, you’ve got to know what you’re about. You’ve got to know what your call is. You’ve got to know why God placed you on this earth for such a time as this. So how do you figure out what you’re called to do? It’s really not hard. I’ve written two articles about this that give you specific questions you can ask yourself about your own personality, likes, dislikes, etc. When you put your answers together, these articles show you how you can see clearly what you’re called to do. If you’ll get alone with the Lord and ask yourself the questions listed in the articles above, He’ll show you exactly what your calling is. Finally, you have to learn what God’s Word says about day-to-day behavior. If you don’t know that the Bible says NOT EVER to co-sign a loan, you’ll sign your name on the loan papers whenever your bankrupt relative/child asks you to. And then, probably not too long later, you’ll find YOURSELF on the hook for thousands of dollars–possibly bankrupting yourself. If you don’t know that God’s Word says a worker is worthy of their hire, you’ll believe the people who tell you that your full-time ministry should be given away for free–even if your house is in foreclosure, your bills are all late, and you can’t feed your kids. If you don’t know that God’s Word says that a person who won’t work shouldn’t eat, then you’ll give in when your adult, able-bodied child/friend/ex-spouse/etc wants you move in with you, use you, and let you take care of them–so they can play video games all day. All of those things are situations where the enemy is trying to manipulate you. When it happens, just say no! If God’s Word says it, we need to know it. We need to know every bit of truth from every page, every letter, every sentence of God’s Word. Beloved, you don’t have to give in to manipulation. You don’t have to be easily manipulated–or manipulated at all. You can be completely free. Free to hear God and say what He says. Free to see God and do what He does. You just have to know what His Word says about who you are and what you’re called to do. When you find that out, you’ll be able to stand with the shield of faith over you, defeating all the fiery darts of the enemy. Have you been finding yourself easily manipulated? Do you know who you are and what you’re about? If this message helped you, please leave a comment below! Jamie, You are my Angel sent from God to keep his children’s encourage. This is what you are to me. I have had me own family members to manipulated to just put me down. But now God sent me to your site. And how you words encourage me. And now I go to God’s word and talk to our Papa God who loves us so much. I stay away from people that don’t me no good. So I pray for them and let go and let God. I thank you again my Angel. Thank You Achoti for faithfully sharing & teaching directly from the Holy Spirit! Wow!! Absolutely awesome article that gets to the point. If more and more people really knew their identity in Christ, many of the issues and burdens we face would just disappear. Thank you for your loving kindness Jamie in speaking truth. Too often it is easy to confuse being kind (biblically speaking truth in love) and being “nice” (basically gutlessness backed up by wrongly interpreted bible verses). Jesus lovingly spoke truth — even the hardest truths- and then backed up and respected the individuals enough to let them sit in that truth and do with it what they would like — draw closer to him or move away. Thank you for encouraging us to align under His definition of us. Once based solidly on a biblical foundation, many of these issues resolve themselves because we learn to speak from that authority. Keep up the great work. You are wonderfully filled w His truth. I want to say thanks to the young lady who had the courage to ask the question on manipulation first of all. Thank you young lady. 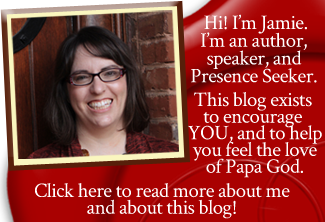 Jamie, your mentoring today has added courage to not give in to times I am being manipulated. It is bad being manipulated but allowing it to go on like I have at times, is a disgrace. I was reminded of the story in John 15 where Jesus talks about the vine, branches, pruning etc. Your answer today was the pruning to help me to increase in being bold and courageous, and I thank you so much for your time. Thank you so much for your obedience to the Lord in all you do. This article was so very helpful!! Thank you Jamie! I know beyond the shadow of the doubt that you’re a human angel GOD has ordained to help people who have been distracted by the enemy. I read the three examples/advice you gave a sweet lady who asked a question concerning manipulation. Well, let me say that I had the same thoughts and questions for years! I would beat myself up when I always fell into a trap of listening to those who wanted me to satisfy their wants and desires and to place mine on hold or to ignore them altogether. Now, I am free, free knowing that I am getting advice from The Holy Spirit daily because many of the things you shared with her were the same words I heard in my spirit verbatim concerning who I am and what I should be doing. Fellow sisters and brothers, I ask that you pray for me. The devil will send minions to distract me on many occasions. Sometimes I listen and others times I recognize it was them trying to distract me and take me out of the position I needed to stay in. Tests and trials will come. But as Jamie shared with us, we must hide the word of GOD in our hearts and minds so that when the enemy comes we can tell him to get away and that he is a liar and the father of them. We can also tell him and his minions through bold confidence that we know who we are, why we’re here and what we’re here to do. So, I encourage you to know that GOD will never leave or forsake us and that as long as we read, study and apply His Words of encouragement and awareness of satan’s tactics, then we will stay in position and receive what He has for us in His timing. Thank you Jamie and the sweet lady who had the courage to share her story about manipulation. I think we all can relate to that. Thanks Jamie for you time and dedication. Thank you for this life giving word! My granddaughter is being manipulated by her boyfriend – he doesn’t have a job and has encouraged them to get a joint checking account. She said they will go to a justice of the peace to get married soon. This is so not of God – I just pray she will see who she is and how precious she is to her Father God. Her name is Abigail which means joy of the Father. She has always had a servant’s heart. Dear God open her eyes!! Ugh! What a yucky situation! Lord, help; save the innocent ones! Bring light into this darkness and help her to know wisdom! In Jesus’ name! This is pretty encouraging stuff. I do appreciate it very much. I’m at a very important point of change in my life. I have some hard thinking and praying to do about what the rest of my earthly life is going to be like… how I am going to best serve the Lord, Jesus Christ. I’m going to carefully examine the resource you have offered here. If I am convinced it is going to help me in my endeavors, then I will use them. Thank you, again, for your time and effort. I am encouraged. Glad this post blessed you, Mary!
? I googled it differently and was finally able to access it on Friday. The article was on manipulation. I was bullied and intimidated for two years at my previous job and manipulated. It was only by the grace of God that I left with peace of mind after He broke the fear I was in through that experience. Your website helped me through those times. God bless you and keep you and make His face shine upon you.